One of the important goals established in the Lower Alsace Township/Mount Penn Borough Joint Comprehensive Plan is to sustain and enhance the economic vitality of the Township and the Borough while maintaining the small town character. 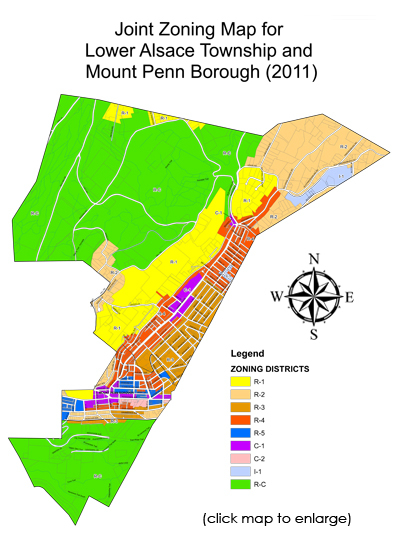 Lower Alsace Township together with the officials of Mount Penn Borough are taking very positive steps towards achieving that goal by updated of the municipal land use regulations with a Joint Zoning Ordinance. Working with Mount Penn Borough officials we hope to share land uses where they are most appropriate in each community; develop an up to date, comprehensive set of regulations that will include design and performance standards and, if enforced consistently, will help to enhance the quality of life in both communities for many years to come. Lower Alsace Township has secured three grants to assist with the cost of this important project from the Berks County Commissioners Conservation Zoning Incentive Program, The PA Department of Community and Economic Development Shared Municipal Services Program and from the Community Conservation Partnerships Program under the administration of the Pennsylvania Department of Conservation and Natural Resources, Bureau of Recreation and the William Penn Foundation in support of the Schuylkill Highlands Mini-Grant Program administered jointly by Natural Lands Trust and Schuylkill River Heritage Association.